This paper would discuss the development of a new open source sensor platform for the interplanetary CubeSat missions. All the existing earth orbiting CubeSat missions employ a beacon to transmit the housekeeping parameters of the satellite, the limitation being they can transmit only on VHF/UHF or S band. The new sensor platform developed will be capable of detecting the level of radiation observed at any particular time and will have the capability to transmit this information along with the housekeeping parameters of the satellite using a software defined radio. This system would thus help us in identifying places like the South Atlantic anomaly region, which might exist in different locations in our solar system. 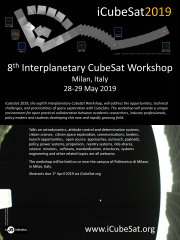 This paper would thus discuss the feasibility and engineering aspects involved in the development of such a platform for the interplanetary CubeSat missions.